Introducing L'Anza Keratin Healing Oil Hair Treatment: an ultra-healing blend of Keratin Protein and Phyto IV Complex combine to leave hair incredibly soft and smooth with a healthy, radiant shine. Ideal for all hair types. - Keratin Healing System heals excessively damaged hair. - Boosts hairs strength and elasticity for all hair types. - Delivers fortifying Keratin Protein. - Reconstructs hairs inner layers. - Phyto IV Complex rehydrates & restores. - Hair becomes velvety-soft and silky-smooth. - Heat protection up to 500 F/260 C.
- Shields against UVA/UBC/UVC rays. - Stops humidity to prevent frizz. Contains: L'Anza Healing Haircare's Phyto IV Complex is an extraordinary blend of Abyssinian Flower Oil, Coffee Seed Oil, Acai Fruit Oil, Babassu Kernel Oil to moisturise, nourish and protect excessively dry, stressed hair. These restorative botanical oils provide ideal levels of essential fatty acids, emollients and nutrients to leave hair incredibly soft, smooth and healthy. Directions for use: Distribute a small amount of L'Anza Keratin Healing Oil Hair Treatment throughout damp or dry hair, then blow dry or style as desired. 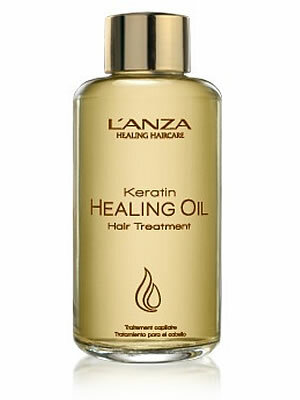 L'Anza Keratin Healing Oil Hair Treatment is the ideal-salon prescription for severely stressed hair. Especially formulated to heal hair that has been excessively damaged by daily aggressors and chemical services. It quickly restores strength, elasticity and smoothness. Use as a hair healing treatment, especially after colour and lightening services.